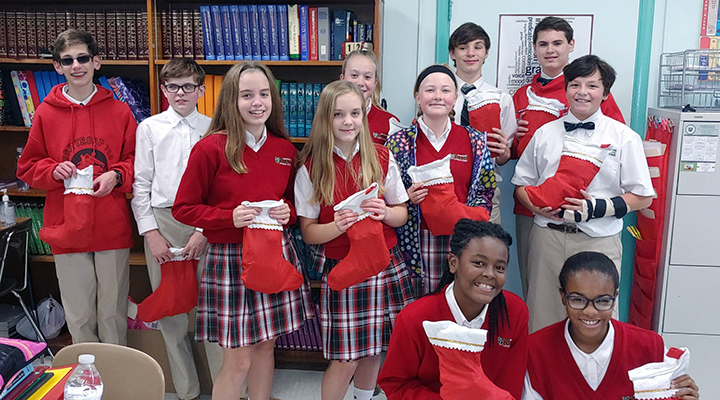 Monsignor Slade Catholic School students spent the week of Veterans Day stuffing stockings for our soldiers serving around the world. Monsignor Slade students, teachers, faculty, staff and their families provided enough stocking stuffers to fill 275 stockings. Our efforts are part of a larger project through Kirkley-Ruddick Funeral Home in Glen Burnie, Maryland. We are happy to partner with them for support in sending the stockings to our soldiers. Our students filled the stockings throughout the week for soldiers and their K-9 counterparts. Each grade gathered travel-sized toiletries, toothbrushes, toothpaste, floss, candy, gum, sunscreen, wet wipes, activity books, pens pencils, hand-written notes and more. Some families even contributed goodies for our military’s K-9 members. Every time a load of stockings was dropped off at Kirkley-Ruddick, Slade students were commended for how neatly the stockings were filled and closed and how well packed the deliveries were. The generosity of our Slade community will greatly impact those serving our country away from home this holiday season. Fun activities such as this one, help us to inspire even the youngest disciples of Christ, encouraging their hearts for service. In this Archdiocesan year of service, Monsignor Slade Catholic School continues to show to our community and the greater area that service is at the heart of our mission--service to our students and in turn, service to our greater community.